What a week! I've been busy at work + trying to get my closet organized - it has been a feat! I am trying my hardest to weed out clothes I don't wear very often, but I always come up with one reason or another as to why I can't get rid of it. I also have tried to plan ahead for the events I have this season. This summer will be a very busy one, so deciding ahead of time what I'll wear to each will (hopefully) keep me from purchasing something new for each event. Versatility is so key, particularly with dresses. As much as I would love a new dress for each and every thing I go to, it's neither practical nor feasible, so finding pieces that work for a variety of situations makes getting ready a little bit easier As wedding season has officially begun, I have a variety of weddings, showers, and parties to attend. Luckily, I have a few beautiful Maggy London dresses in my closet. Today, I'm excited to share this two-tone midi dress. I love the brand's dresses (see the first two collaborations here and here), but I was excited to give the midi-style a try, as it's not something I normally wear. 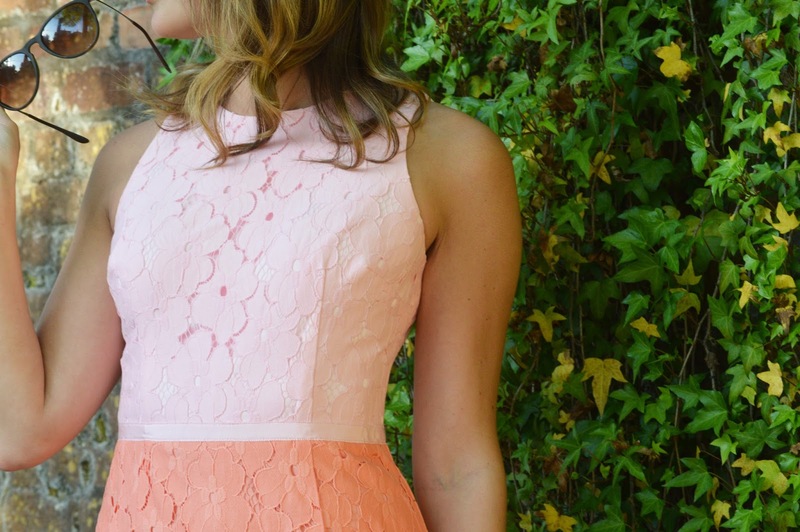 The eyelet lace is so feminine, and this dress is a perfect garden party or bridal shower dress. I love pinks and peaches, so a two-tone option is a fun addition to my closet - and perfect for a variety of occasions. P.S. Can we talk about this gorgeous weather? Yesterday was 90 degrees - I still can't believe how warm it is this week! No complaints here.